intrigued by the idea of yoga and know that you could benefit - but don't like the idea of going to a regular yoga studio or gym? this class allows you to press pause on the stresses of the week in a serene, private studio in the woods. give yourself the gift of radical self-care! slow-flow movement + restorative + breath work + meditation + a long, luxurious savansana = a more relaxed, mindful you! email me if you are interested in attending so I have everything set up for you. 5- and 10-class cards: $75 for 5-class card, good for 3 months; $135 for 10-class card, good for 6 months. $17/session, cash or check for drop in. 3:00 - 4:15 pm. You are welcome to stay for tea afterward and get to know fellow yogis! in terms of self-care, private yoga is one of the most comprehensive gifts you can give to yourself. This ancient modality addresses mind, body and spirit in a way that few other practices do. If you're ready to embrace radical self-care, contact me to learn more. you put so much into planning your wedding day. allow yourself the gift of feeling grounded, centered and fully present for one of the most important days of your life - through a private yoga session for you and your partner, your whole wedding party or your family. i will customize the session to meet your needs, whether you're a dedicated yogi or have never done yoga in your life. melt stress, open up space in your body for finding your true voice, soothe your emotions - and so much more. from a simple flow or restorative class to a session that includes enjoying bubbly and locally made chocolate truffles afterwards, my intention is to help you and those close to you create a meaningful, calm and memorable experience. weddings are filled with ritual and ceremony , but little, if anything, that allows space for personal, private reflection. this can be challenging to find on your own and is the space that union vashon creates for you in order to be at your best on your wedding day. after putting so much effort into planning, have a moment before your wedding to get grounded and feel truly present with one another. clear your head of all the 'doing' and stress and give yourselves permission to relax and be in the moment during the wedding itself. this is your time to connect and be with one another. sessions are a blend of slow vinyasa with gentle restorative and meditation and a nice, long savasana. specific requests are welcomed for further customization. a different way to bond with your wedding party or family, relax and have fun together. pamper yourself! a melding of vinyasa with some relaxing restorative for any and all levels. specific requests are welcomed for further customization. the seed for the idea of yoga for wedding parties was planted when, the day before my own wedding in 2008, i hired a yoga teacher whose classes i had attended and loved to do a private session with my sisters and friends. we all agreed that it was a wonderful way to set the tone for the wedding! developing the concepts of mindfulness, deep presence and creating sacred space, honoring each individual's beliefs and values - these are what matter to me as your officiant. 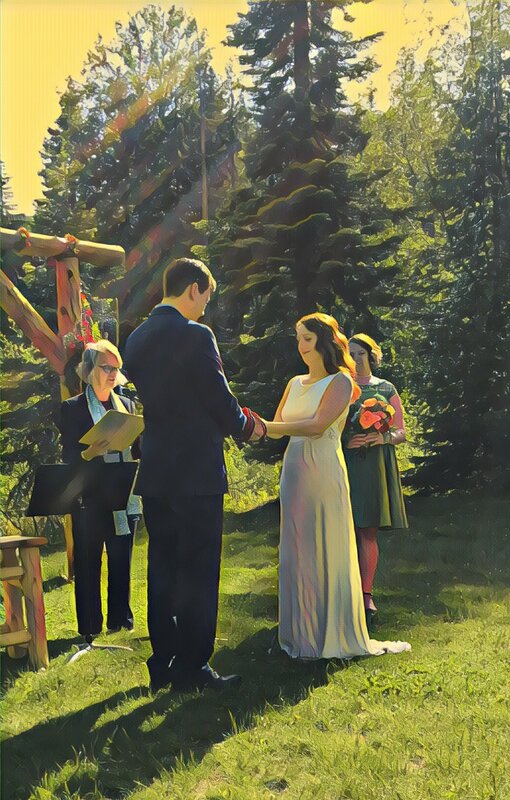 as a certified life-cycle celebrant,™ i create, along with you, a personalized and unique ceremony that integrates your unique story, beliefs and values in a way that makes your wedding ceremony truly meaningful and memorable. if you aren't connected to a specific religion but consider yourself spiritual, i can provide an alternative way to honor this transition in a beautiful and expressive way.